The Three Muses theme for this week is HEARTS. I drew the face and pasted at the body of a paper doll. Hearts: Createwing Designs, Crowabout Studio, Rucola Designs, Astrid Mclean and Angie Young. Overlay: Parée. Cool - roaring 1920ies style goes to heart! Clever combinded. Gorgeous...fabulous background and I adore that dress. Oh, what a beautiful collection of hearts and colours! I do love your paperdoll Chris! What a beauty, nice, very nice creation! I love the glorious array of hearts! 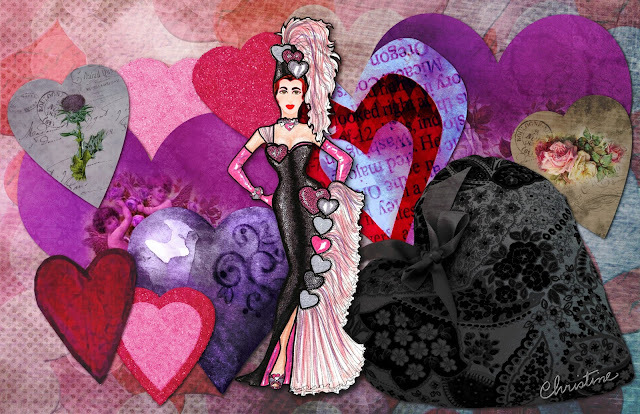 A gorgeous creation of mixed hearts and high fashion! Love all the hearts and the colour palette too. Take a bow, my friend. A spectacular collection of hearts and stunning colour choices. Fantastic.